Located on the sandy shores of Mismaloya beach, just south of Puerto Vallarta, the all-inclusive Barceló Puerto Vallarta is surrounded by breathtaking mountain and ocean views. The resort’s 316 spacious, luxury suites all boast either a terrace or balcony from which guests can admire the lush vegetation, clear pools and impressive Banderas Bay. Enjoy a wide variety of dining experiences including traditional Mexican, Spanish, Italian and Japanese cuisines. Exotic drinks are served at any of the four swimming pools or on the semi-private beach. The resort’s U-Spa offers many rejuvenating treatments. Premium Level offers an elevated experience including unlimited access to specialty restaurants, access to the Premium Lounge, room service, Internet and more. 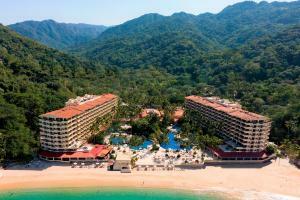 On the beach on the Bay of Mismaloya, 15 minutes south of downtown Puerto Vallarta, 45 minutes from the airport. Don Quijote; Grill Los Arcos; La Fuente, Kyoto; Capri & La Cantina.